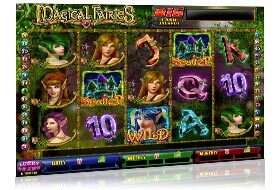 Online slots are one of the best known casino games, play free online for fun or for real money. 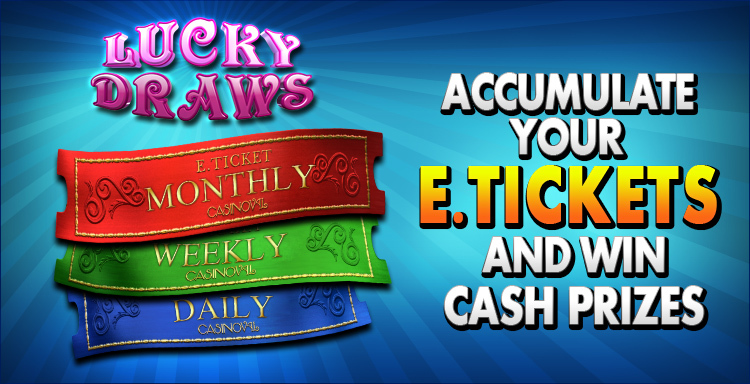 Free Download and register at our casino online and have the option to participate in electronic sweepstakes daily, weekly and monthly. 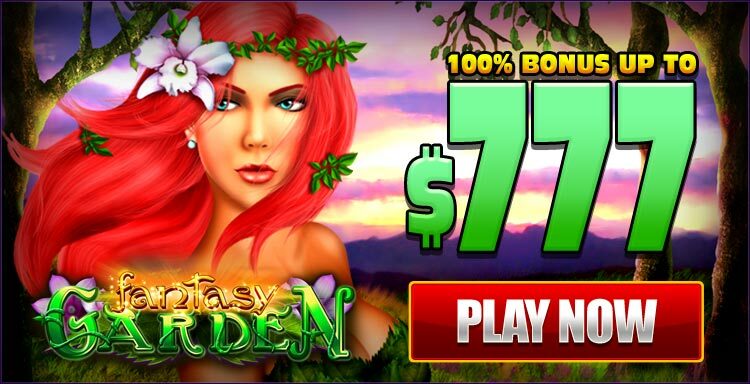 Promotions and Free Bonus Online Casinos. 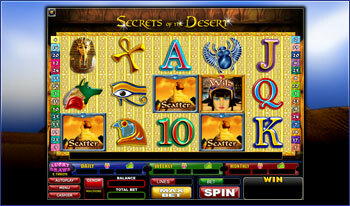 SECRETS OF THE DESERT can be played by to the maximum of 25 lines with denomination currency of 0.01, 0.02 and 0.05. The prize is doubled if one or more CLEOPATRA replaces in a winning combination. CLEOPATRA replaces all symbols except scattered SPHINX. The Free Game feature is triggered when SPHINX appears 3 or more times in a combination. Up to 20 Free Games are awarded, but you can get 1,000 free games during the free game feature. Highest win only on each lit line. Coinciding wins on different lit lines are added. Line wins are multiplied by the amount bet per line. Scattered symbols wins are multiplied by the total bet. 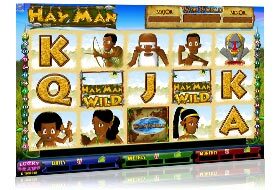 Scattered symbols wins are added to payline wins. All symbols pay left to right, except scattered SPHINX which pays any. CLEOPATRA substitutes for all symbols except scattered SPHINX. Prize is doubled if one or more CLEOPATRA substitutes in a winning combination. The Free Games Feature is triggered when SPHINX appears three or more times in a combination. Up to 20 free games are awarded. A multiplier between 2 and 4 can be awarded. A maximun of 1000 free games can be awarded during the feature. The feature can be retriggered. Free games are played at the lines and bet of the trigger game. Free game wins are added to payline and scatter wins. 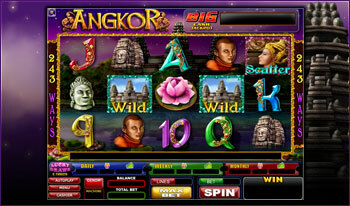 ANGKOR has the magnificent feature that 243 lines can be played. The choice of denomination currency is 0.01, 0.02 and 0.05. Increase your winnings by playing max bet. ANGKOR WAT TEMPLE appears in reels 2 and 4 only, and replaces all symbols including scattered DANCER When the ANGKOR WAT TEMPLE appears in an inactive position it replaces scattered DANCER only. Choose your bet per reel. Choose the number of reels to play. Total bet is the selected bet per reel cost multiplied by the reel cost (see table). Payouts are made according to the scorecard. Winning combinations pay through any position on the bought reels and the centre line on other reels. Winning combinations are multiplied by the bet per reel cost. Scattered symbols wins are multiplied by the total bet. Scattered symbols wins are added to reel wins. Highest win awarded for each symbol combination. The Free Games Feature is triggered when DANCER appears left to right 3, 4 or 5 times in a combination. 10, 15 or 20 free games are awarded respectively. If ANGKOR WAT TEMPLE substitutes in a winning combination on reel 2 only, that prize is multiplied by 3. 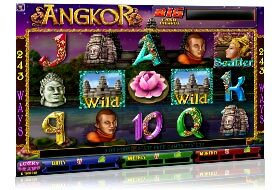 If ANGKOR WAT TEMPLE substitutes in a winning combination on reel 4 only, that prize is multiplied by 4. If ANGKOR WAT TEMPLE substitutes in a winning combination on reel 2 and 4, that prize is multiplied by 12. 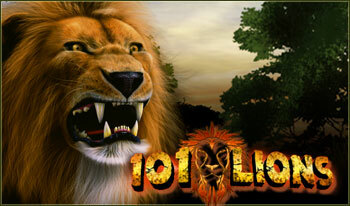 101 LIONS, is a thrilling game where you can be rewarded a bonus within a bonus. 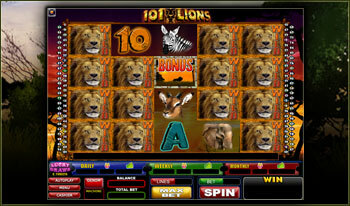 The more clusters of lions that appear on the screen, the higher the payout. It can be played from 1 to 101 lines with denominations of 0.01, 0.02 and 0.05. You can be rewarded 12 FREE GAMES when the scattered BONUS appears on reel 2, 3 and 4 at the same time and if during Free Games scattered BONUS appears on reel 2, 3 and 4 again at the same time you will get 12 additional free games. Highest win only on each lit line. Coinciding wins on different lit lines are added. Line wins are multiplied by the amount bet per line. Scattered symbols wins are multiplied by total bet. Scattered symbols wins are added to payline wins. All symbols pay left to right except scattered BONUS which pays on reels 2, 3 and 4. LION substitutes for all symbols except scattered BONUS. Appears on reels 2, 3 and 4 only. The Free Games Feature is triggered when BONUS appears anywhere on reels 2, 3 and 4 at the same time. 12 free games are awarded. The feature can be retriggered. 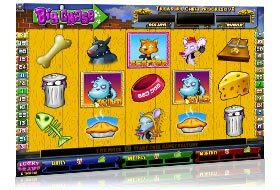 Free games are played at the lines and bet of the trigger game. Free game wins are added to payline and scatter wins. SCATTER on reels 2, 3 and 4 starts free games feature. 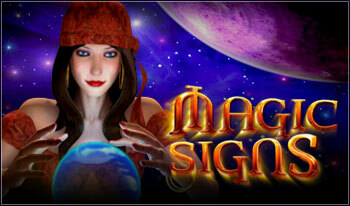 MAGIC SIGNS, this game can be played up to 25 lines with denomination currency of 0.01, 0.02 and 0.05. The GYPSY symbol pays the highest, and replaces all symbols except scattered TAROT. When scattered TAROT appears 3 or more times in a combination you can win up to 25 Free Games. During the Free Game Bonus, all prizes are tripled. Highest win only on each lit line. Coinciding wins on different lit lines are added. Line wins are multiplied by the amount bet per line. Scattered symbols wins are multiplied by total bet. Scattered symbols wins are added to payline wins. All symbols pay left to right except scattered TAROT which pays any. GYPSY substitutes for all symbols except scattered TAROT. The prize is doubled when GYPSY substitutes into a winning combination. The Free Games Feature is triggered when TAROT appears three or more times in a combination. 15, 20 or 25 free games are awarded if 3, 4 or 5 TAROT appears, respectively. The feature can be retriggered when TAROT appears two or more times in a combination. 10, 15, 20 or 25 additional free games are awarded if 2, 3, 4 or 5 TAROT appears, respectively. During the Free Games Feature all prizes are tripled. Free games are played at the lines and bet of the trigger game. Free game wins are added to payline and scatter wins. 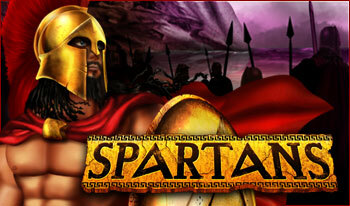 SPARTANS, this game can be played up to 30 lines with the denomination currency of 0.01, 0.02 and 0.05. The SPARTAN QUEEN substitutes all symbols except scattered XERXES. Playing this game, you could be awarded with a 100 Free Games And during the Free Games you can win additional Free Games. You receive Free Games when scattered XERXES appears 3, 4 or 5 times in a combination. Highest win only on each lit line. Coinciding wins on different lit lines are added. Line wins are multiplied by the amount bet per line. Scattered symbols wins are multiplied by total bet. Scattered symbols wins are added to payline wins. All symbols pay left to right except scattered XERXES which pays any. SPARTAN QUEEN substitutes for all symbols except scattered XERXES. The Free Games Feature is triggered when XERXES appears 3, 4 or 5 times in a combination. 15, 30 or 100 free games are awarded respectively. All prizes during the free games are doubled. During the Free Games additional SPARTAN QUEEN symbols are stacked. The feature can be retriggered. Free Games are played at the lines and bet of the trigger game. Free Game wins are added to payline and scatter wins. Play 1125 ways fixed at a cost of 50 credits. Payouts are made according to the scorecard. Winning combinations are multiplied by the bet per reel cost. Scattered symbol wins are multiplied by total credits bet. Scattered symbol wins are added to reel wins. Highest win awarded for each symbol combination. Coinciding wins of different symbols are added. All symbols pay left to right except scattered BONUS which pays on any position. EAGLE appears on reels 2 and 4 only and substitutes for all symbols except scattered BONUS. 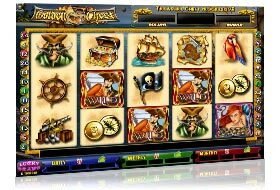 The Free Games feature is triggered when scattered BONUS appears three or more times in a combination. 10, 15 or 20 free games are awarded. During the Free Games feature EAGLE symbols are stacked on reels 2 and 4. The feature can be retriggered. Highest win only on each lit line. Coinciding wins on different lit lines are added. Line wins are multiplied by credits bet per line. Scattered symbol wins are multiplied by total credits bet. Scattered symbol wins are added to payline wins. All symbols pay left to right except scattered LEGENDARY STONE which pays on reels 2, 3 and 4. WARRION substitutes for all symbols except scattered LEGENDARY STONE. Scattered LEGENDARY STONE appears on reels 2, 3 and 4 only. The Free Games feature is triggered when scattered LEGENDARY STONE appears anywhere on reels 2, 3 and 4 at the same time.5, 7 or 9 free games are awarded. The feature can be retriggered. Free Games feature is played at the lines and bet of the triggering combination. Highest win only on each lit line. Coinciding wins on different lit lines are added. Line wins are multiplied by the amount bet per line. Scattered symbols wins are multiplied by total bet. Scattered symbols wins are added to payline wins. All symbols pay left to right except scattered CAVEMAN which pays any. WILD substitutes for all symbols except scattered CAVEMAN. 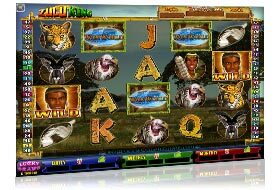 When WILD appears on reel 3, all wins with substitution can be doubled or multiplied by 5. 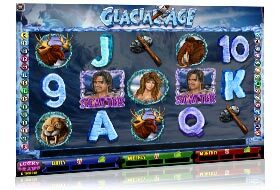 The Free Games Feature is triggered when CAVEMAN appears three or more times in a combination. 10, 15 or 20 free games are awarded. A multiplier between 2 and 4 can be awarded. The feature can be retriggered. Free games are played at the lines and bet of the trigger game. Free game wins are added to payline and scatter wins. Highest win only on each lit line. Coinciding wins on different lit lines are added. Line wins are multiplied by the amount bet per line. Scattered symbols wins are multiplied by the total bet. Scattered symbols wins are added to payline wins. All symbols pay left to right except scattered WON WORLD which pays any. BUSHVELD substitutes for all symbols except scattered WON WORLD. 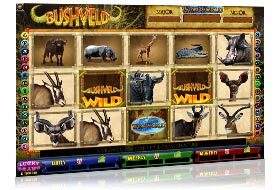 The prize is doubled when BUSHVELD substitutes in a winning combination. The free games feature is triggered when WON WORLD appears three or more times in a combination. 10 free games are awarded. The prizes awarded each free game are multiplied by the free game number. The feature can be retriggered. Up to a maximun of 50 free games can be awarded during the feature. Free games are played at the lines and bet of the trigger game. Free game wins are added to payline and scatter wins. Highest win only on each lit line. Coinciding wins on different lit lines are added. Line wins are multiplied by the amount bet per line. Scattered symbols wins are multiplied by the total bet. 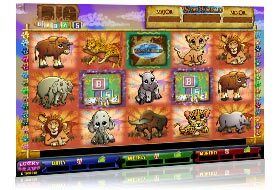 Scattered symbols wins are added to payline wins. All symbols pay left to right except scattered WON WORLD which pays any. CUBES substitutes for all symbols except scattered WON WORLD. The prize is tripled when CUBES substitutes in a winning combination. The Free Games Feature is triggered when WON WORLD appears three or more times in a combination. 10, 12 or 14 free games can be awarded. A multiplier between 2 and 4 can be awarded. The feature can be retriggered. Free games are played at the lines and bet of the trigger game. Free game wins are added to payline and scatter wins. 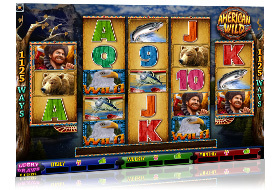 Highest win only on each lit line.Coinciding wins on different lit lines are added.Line wins are multiplied by the amount bet per line.Scattered symbols wins are multiplied by the total bet.Scattered symbols wins are added to payline wins.All symbols pay left to rigth except scattered WON WORLD which pays any. HAY MAN substitutes for all symbols except scattered WON WORLD.The prize is doubled when HAY MAN substitutes in a winning combination. The Free Games Feature is triggered when WON WORLD appears three or more times in a combination. 10, 15 or 20 free games can be awarded. A multiplier between 2 and 4 can be awarded. The feature can be retriggered. Free games are played at the lines and bet of the trigger game. Free game wins are added to payline and scatter wins. Highest win only on each lit line. Coinciding wins on different lit lines are added. Line wins are multiplied by the amount bet per line. Scattered symbols wins are multiplied by total bet. Scattered symbols wins are added to payline wins. All symbols pay left to right except scattered WON WORLD which pays on reels 2, 3 and 4. ZULU KING substitutes for all symbols except scattered WON WORLD. Appears on reels 2, 3 and 4 only. FREE GAMES FEATURE The Free Games Feature is triggered when WON WORLD appears anywhere on reels 2, 3 and 4 at the same time. 5, 7 or 9 free games are awarded. The feature can be retriggered. Free games are played at the lines and bet of the trigger game. Free game wins are added to payline and scatter wins. Highest win only on each lit line. Coinciding wins on different lit lines are added. Line wins are multiplied by credits bet per line. Scattered symbol wins are multiplied by total credits bet. Scattered symbol wins are added to pay line wins. All symbols pay left to right except scattered FAIRIES CASTLE which pays on any position. FAIRY QUEEN substitutes for all symbols except scattered FAIRIES CASTLE. - If the 1st FAIRY QUEEN appears on reel 3, the GREEN FAIRY will become Wild. - If the 2nd FAIRY QUEEN appears on reel 3, the PINK FAIRY will become Wild. - If the 3rd FAIRY QUEEN appears on reel 3, the YELLOW FAIRIES will become Wild. - If the 4th FAIRY QUEEN appears on reel 3, the ORANGE FAIRY will become Wild. Highest win only on each lit line. Coinciding wins on different lit lines are added. Line wins are multiplied by the amount bet per line. Scattered symbols wins are multiplied by total bet. Scattered symbols wins are added to pay line wins. All symbols pay left to right except scattered ORCHID which pays any. EVA substitutes for all symbols except scattered ORCHID. The prize is doubled when EVA substitutes in a winning combination. The Free Games Feature is triggered when ORCHID appears three or more times in a combination. 15 free games are awarded with all prizes tripled. The Free Games Feature can be retriggered. Free games are played at the lines and bet of the trigger game. Free game wins are added to pay line and scatter wins. Highest win only on each lit line. Coinciding wins on different lit lines are added. Line wins are multiplied by the amount bet per line. Scattered symbols wins are multiplied by total bet. Scattered symbols wins are added to pay line wins. 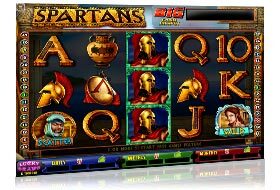 All symbols pay left to right except scattered CAESAR which pays on reels 2, 3 and 4. CLEOPATRA substitutes for all symbols except scattered CAESAR. Appears on reels 2, 3 and 4 only. The Free Games Feature is triggered when CAESAR appears anywhere on reels 2, 3 and 4 at the same time. 12 free games are awarded. The feature can be retriggered. Free games are played at the lines and bet of the trigger game. Free game wins are added to pay line and scatter wins. Choose your bet per reel. Choose the number of reels to play. Total bet is the selected bet per reel cost multiplied by the reel cost (see table). Payouts are made according to the scorecard. Winning combinations pay through any position on the bought reels and the centre line on other reels. Winning combinations are multiplied by the bet per reel cost. Scattered symbols wins are multiplied by the total bet. 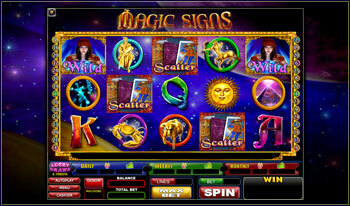 Scattered symbols wins are added to reel wins. Highest win awarded for each symbol combination. Coinciding wins of different symbols are added. All symbols pay left to right including scattered DANCER. ANGKOR WAT TEMPLE appears on reels 2 and 4 only and substitutes for all symbols including scattered DANCER. When ANGKOR WAT TEMPLE appears in an inactive position, it substitutes scattered DANCER only. Highest win only on each lit line. Coinciding wins on different lit lines are added. Line wins are multiplied by the amount bet per line. scattered symbols wins are multiplied by the total bet. 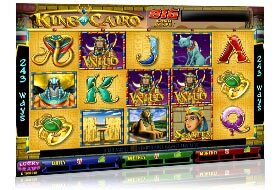 scattered symbols wins are added to payline wins. All symbols pay left to right except scattered PHARAO which pays any. MYSTIC QUEEN substitutes for all symbols except scattered Pharaoh. The Prize is doubled when MYSTIC QUEEN substitutes in a winning combination. The Free Games Feature is triggered when PHARAOH appears three or more times in a combination. Up to 25 free games are awarded. A multiplier between 2 and 5 can be awarded. Choose 1 of the statue to reveal the number of free games awarded. Choose 1 of the chest to reveal the free games multiplier. The free games feature can be retriggered at the same number of free games and multiplier as originally chosen. Free games are played at the lines and bet of the trigger game. Free game wins are added to payline and scatter wins. Choose your bet per reel. Choose the number of reels to play. Total bet is the selected bet per reel cost multiplied by the reel cost (see table). Payouts are made according to the scorecard. Winning combinations pay through any position on the bought reels and the centre line on other reels. Winning combinations are multiplied by the bet per reel cost. Scattered symbols wins are multiplied by the total bet. Scattered symbols wins are added to reel wins. Highest win awarded for each symbol combination. Coinciding wins of different symbols are added. All symbols pay left to right except scattered NEFERTITI which pays any. PHARAOH appears on reels 2, 3 and 4 only and substitutes for all symbols except scattered NEFERTITI. 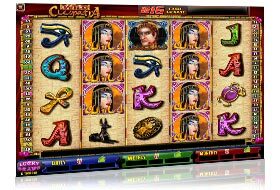 The Free Games Feature is triggered when NEFERTITI appears three or more times in a combination. 10, 15, 20 or 25 free games are awarded with all prizes doubled. The feature can be retriggered with the same number of free games as the original trigger. Free games are played at the reels and bet of the trigger game. Free game wins are added to reel and scatter wins. Highest win only on each lit line. Coinciding wins on different lit lines are added. Line wins are multiplied by the amount bet per line. Scattered symbols wins are multiplied by the total bet. Scattered symbols wins are added to payline wins. All symbols pay left to right except scattered MOUNT ROUSHMORE which pays any. UNCLE SAM substitutes for all symbols except scattered MOUNT ROUSHMORE. Prize is doubled if one or more UNCLE SAM substitutes in a winning combination. The Free Games Feature is triggered when MOUNT ROUSHMORE appears three or more times in a combination. Up to 100 free games are awarded with all prizes doubled. The feature can be retriggered. 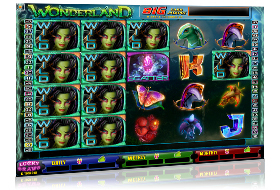 A maximum of 500 free games can be awarded during the feature. Free games are played at the lines and bet of the trigger game. 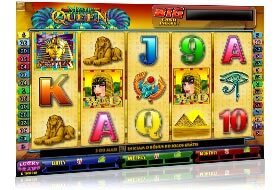 Free game wins are added to payline and scatter wins. Highest win only on each lit line. Coinciding wins on different lit lines are added. Line wins are multiplied by the amount bet per line. Scattered symbols wins are multiplied by the total bet. 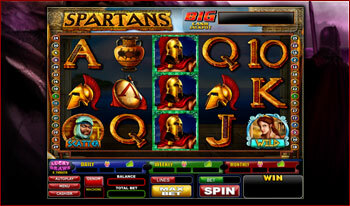 Scattered symbols wins are added to payline wins. All symbols pay left to right except scattered CHEAT CAT which pays any. BAD DOG substitutes for all symbols except scattered CHEAT CAT. The prize is tripled when BAD DOG substitutes in a winning combination. The Free Games Feature is triggered when CHEAT CAT appears three or more times in a combination. 12 free games are awarded with all prizes tripled. The feature can be retriggered. Free games are played at the lines and bet of the trigger game. Free game wins are added to payline and scatter wins. Highest win only on each lit line. Coinciding wins on different lit lines are added. Line wins are multiplied by the amount bet per line. Scattered symbols wins are multiplied by the total bet. Scattered symbols wins are added to payline wins. All symbols pay left to right, except scattered LEPRECHAUN which pays any. PINK FAIRY substitutes for all symbols except scattered LEPRECHAUN. The Re-Spin Feature is triggered when LEPRECHAUN appears two times in a combination. All pays are evaluated on the triggering spin. The reels that have the 2 triggering symbols are held and the remaining 3 reels are respun once only. Pays are then paid for the Re-Spin. The Free Games Feature can be triggered during the Re-Spin Feature. The Re-Spin Feature is played at the lines and bet of the trigger game. The Free Games Feature is triggered when LEPRECHAUN appears three or more times in a combination. 10 free games are awarded with all prizes doubled. The feature can be retriggered. The Re-Spin Feature cannot be triggered during the Free Games Feature. Free games are played at the lines and bet of the trigger game. Highest win only on each lit line. Coinciding wins on different lit lines are added. Line wins are multiplied by the amount bet per line. Scattered symbols wins are multiplied by the total bet. Scattered symbols wins are added to payline wins. All symbols pay left to right except scattered BRAVE LADY which pays any. CAPTAIN SHADOW appears on reels 2, 3 and 4 only and substitutes for all symbols except scattered BRAVE LADY. The Free Games Feature is triggered when BRAVE LADY appears three or more times in a combination. 10 free games are awarded with all prizes doubled. The Free Games Feature is retriggered when BRAVE LADY appears two or more times anywhere. Free games are played at the lines and bet of the trigger game. Free game wins are added to payline and scatter wins. 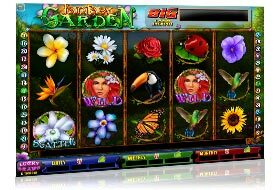 Online Casino Games with exclusive promotions, bonuses on your first deposit. 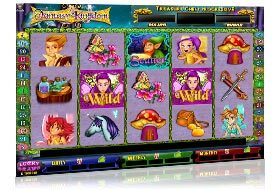 Download our free software online casino games.